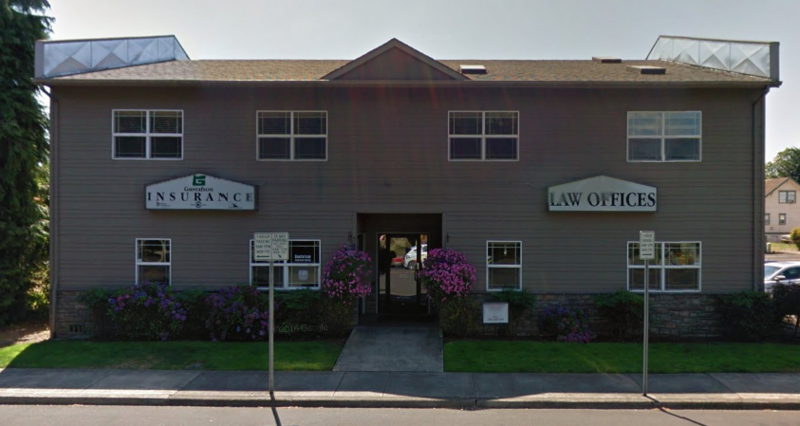 On the morning of March 15, a Senior HawkSoft CSR walked into an insurance agency in the rural town of Canby, OR, to spend a day in the life of an insurance agent. 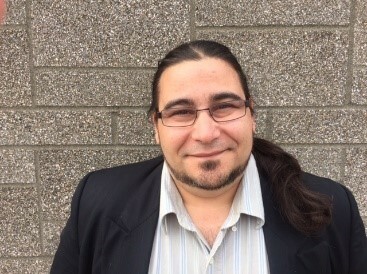 Nick Wills is one of the first HawkSoft CSRs to participate in a new and nontraditional venture, Agency Job Shadowing. That’s fitting because HawkSoft is, afterall, a nontraditional company. The customer service department at HawkSoft is on a mission to help our CSRs become more deeply rooted in the insurance industry so we can take the customer experience to the next level. We already rank as one of the best insurance management systems with a 93% first-call resolution rate and 98% satisfaction rate by callers. We’re not resting there, though. We want to continue our culture of improvement. Before we embark on Nick’s experience, let’s discuss how customer experience impacts the independent agent and what resources you can use to help transform your customer experience. The term “customer experience” is thrown around a lot. Especially in our industry where one of the core value benefits for using an independent agent over direct writers is a laser-like focus on delivering a phenomenal customer experience. But, what does this really mean? And what is the difference between customer service versus customer experience? Customer service is just one aspect of the overall customer experience. Chris Paradiso does a good job illustrating examples of Customer Service vs Customer Experience in the Insurance Industry. Customer service is a moment in time, where customer experience dives deeper into understanding customer needs, wants, and feelings that can produce quantifiable business results. Most agencies understand the need for and offer good customer service. But customer experience encompasses much more than the initial sale or the occasional customer support call. It involves various interactions of the customer journey over the life of a relationship. First impressions and perceptions of the product, presentation, or website. How did it make you feel? Did it emote careful thought, attention to detail, and care? Education and messages. Was the language used on the website or advertisement unique and not "canned" or "sanitized"? First experience with customer service. How did I feel after my first conversation with the company? Did the company pick up my phone call quickly? Was there a professional greeting that told me they were organized? Were they knowledgeable? Follow-up experience. Did they listen to my needs and provide follow-up if needed? Did I receive confirmation telling me when I can expect the information I requested? How you manage these interactions with your customer, defined as customer experience management, is the key to increasing customer satisfaction, loyalty and advocacy. 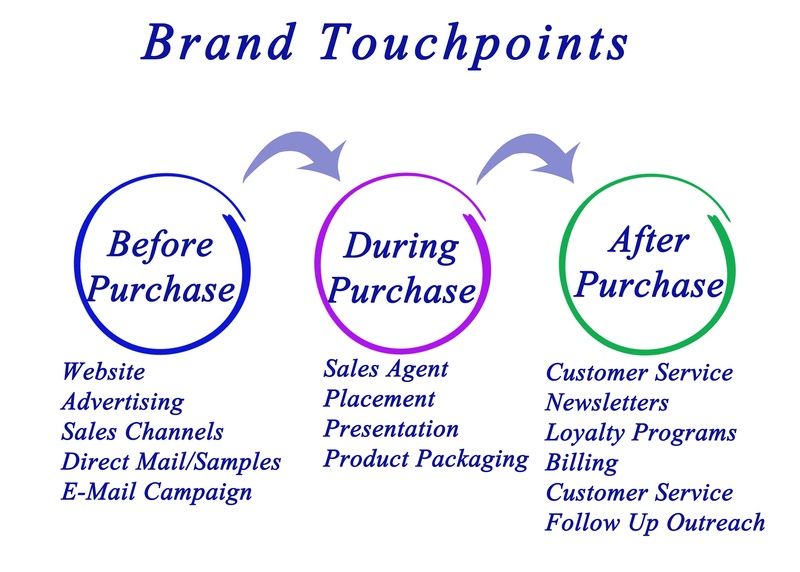 Ask yourself how you manage your customer touchpoints. Do you follow these three steps to getting customer experience management right? Get the right information to the right place at the right time - every time. The customer experience is a key driver of your brand differentiation and customer loyalty. These are two of the biggest drivers of growth and success. Your customers must know why your agency is different so they can communicate that with others in their network. This leads to referrals, which we all know is the most effective vehicle to growth. A study by Oracle found that 74% of senior executives believe that customer experience impacts the willingness of a customer to be a loyal advocate. Insurance agents face a steep challenge, however. Offering an amazing customer experience when you don’t have a tangible product can be challenging. An agent’s product is really a signature on a dotted line – a contract that promises to cover the client’s risks. Clients don’t see pretty colors, smell an enticing aroma, hear the surround sound of Star Wars on a 60” flat screen TV, drool over the photo resolution on the newest phone, or test drive the latest road warrior. How do you build strong relationships and an exemplary customer experience that retains customers and attracts new prospects? Perhaps we can liken this challenge to the famous movie, Field of Dreams (1989), “If you build it, [they] will come.” Build an agency that offers an unprecedented customer experience and success will come through high retention rates and customer referrals. The perfect playing field for success. It should be a goal of every insurance agent to learn what it means to become more customer-centric, and take advantage of new customer experience opportunities through the use of digital and multi-channel tools (phone, email, text, etc.). McKinsey & Company offers four elements to transforming the customer experience in insurance. Another way to gain insight into how customers feel about your brand and services, is to use Net Promoter Score (NPS). NPS helps measure and score your customers’ satisfaction and the likelihood they would recommend you. This invaluable data can help take the guesswork out of which customers need attention and which don’t. It is a proven tool that can help transform the customer experience so you can retain more business and increase profits. Kelly Donahue-Piro, President of Agency Performance Partners, suggests using NPS to create incentive programs around customer experience. 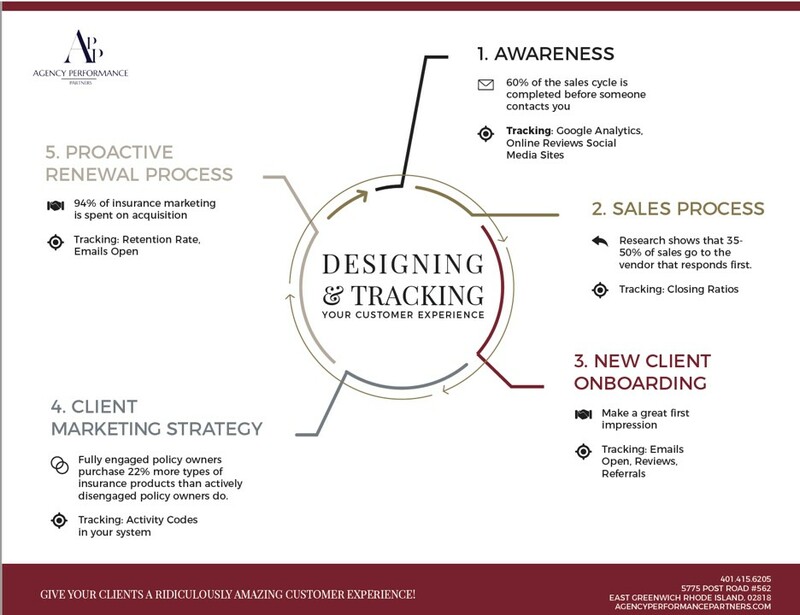 Donahue-Piro also says to track these 5 areas of customer experience to design an impactful customer journey. Transforming the customer experience so it resonates positively with your customers on both the conscious and subconscious level is vital for long-term growth. Here are some additional resources to help get you started on your transformation, including ACT's customer experience planning website. “Delivering an exceptional customer experience” is one of HawkSoft’s core values and a key goal of our customer service department. But it goes beyond being courteous and a savvy call center support representative. Part of this knowledge assimilation is learning to see and understand things from the insurance agent’s angle, not the software developer’s angle. 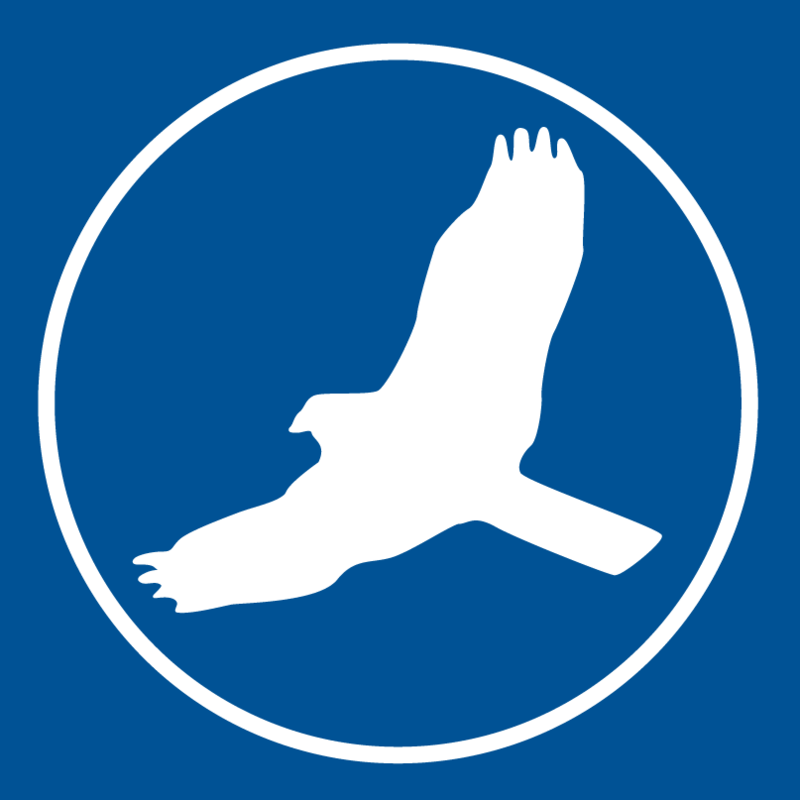 Each HawkSoft CSR receives 20 - 25 calls/day. That’s about 5,000 calls/year! It’s in our best interest to continually improve our understanding of the agent and find innovative ways to transform the customer experience. To help with this customer experience transformation, we decided to get up close and personal with our agents. We are sending CSRs to our agencies to sit and work with them. The Agency Job Shadow program was a novel idea implemented in late 2017 by Aedan James, Director of Customer Service. It is vital that HawkSoft stays in touch with how agents think today. Gaining insight into how a modern agent thinks, what their expectations are of their technology, and knowing how they use the HawkSoft agency management system versus how we think they use it, arms us with invaluable knowledge to build better products and services. This in turn, is part of providing a better customer experience to our agencies. Understand how an agency uses the system for proposals, quotes, renewals, sales and retention, business metrics, billing and other key functions. What kind of things do you think a CSR should know when you call in and talk to them on the phone? Why do you even need an agency management system and how do you apply it to your everyday workflows? 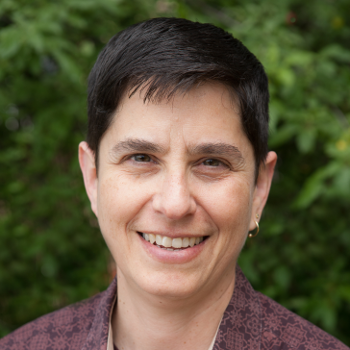 "Staying in tune with our agents helps us come true on being a trusted advisor for technology for agencies, just as the agencies aim to be trusted advisors for their clients." The prime CSR candidate for the job shadow will have been with us about one year. They are experienced enough to answer most HawkSoft management system questions, but still need to learn more about how the system helps fulfill the operational needs of an agency. Have you ever gone on a job shadow? It can be a little awkward and uncomfortable at first, even for the host company. Who likes to be watched and asked questions while you work? But that’s the purpose of a job shadow - to let the shadower watch you and absorb all you do during your work day. It helps HawkSoft CSRs gain first-hand knowledge of how an agency works. We’ll use this experience to provide even better service the next time we receive a support call. Nick worked most of the day with the commercial and personal CSRs, learning their workflows for servicing Gustafson's mainstay clients - farmers. Nick observed their workflow challenges and was instantly able to offer improved efficiencies for quoting and creating proposals through the use of templates and easier workflows. It was also enlightening to learn how so many processes were being done “the hard way”, only because the staff didn’t know there were simpler ways, nor did they have the time to explore the system. Knowing this, we can now cater our support calls to help uncover these “inefficient workflows” and try to alleviate this knowledge gap. Nick gained important insight into how farm policies are processed and the many complexities involved. This information will benefit him on assisting future support calls for other agencies with farm clients. A highlight for Nick was showing the owner, Scott Gustafson, how to use the Agency Intelligence reporting suite in HawkSoft to measure the performance of his business. Scott was amazed to see how easy it was to analyze data and create meaningful reports. He could now also pinpoint areas where data input had to be changed. 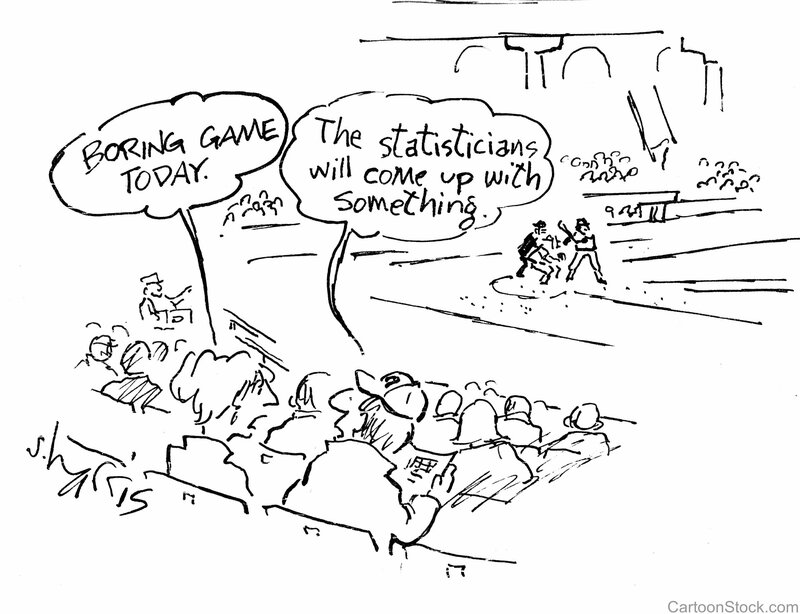 What will your customer experiment be? Job Shadowing isn’t for everyone, but consider how you could use it to transform how your agency delivers on customer experience. It’s an opportunity for your team to get up close and personal with a customer, strengthening the relationship and gaining a better understanding of why and how they use your services. 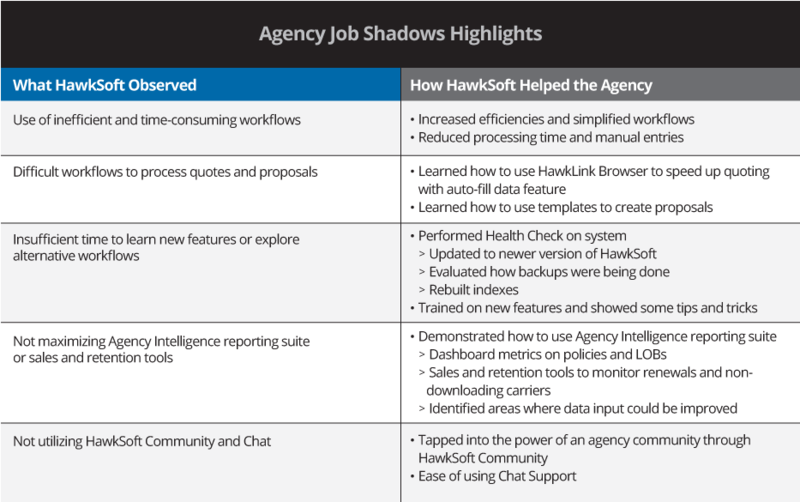 HawkSoft’s program is in its infancy, with just four agency shadows completed. One of the biggest takeaways is learning how to better communicate to our job hosts the purpose of a job shadow, and what that means for both the host and the shadower. Naturally, agencies have been very receptive to the program. Who wouldn’t love the opportunity to have a HawkSoft CSR captive for a day and receive on-site training! 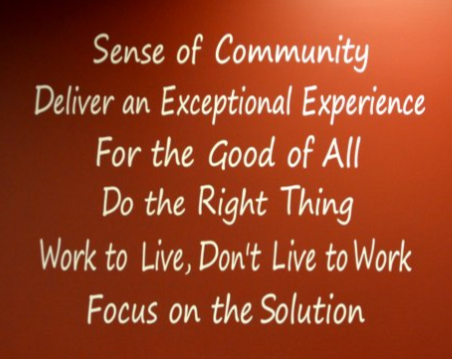 Well, that is definitely included, but the real goal is for our CSRs to observe how the agency conducts workflows, processes quotes and proposals, utilizes reports, tracks sales and retention, and learn why the agency needs our system to conduct business. It lets us see our own company through the eyes of our customers. Only then can we become more educated about how the agent operates and how we can better serve their operational needs. Only then can we strengthen the customer relationship and take the overall customer experience to the next level. Only then can we create evangelism among our clientele, the ultimate goal in customer relationships. We encourage you to evaluate your customer experience. 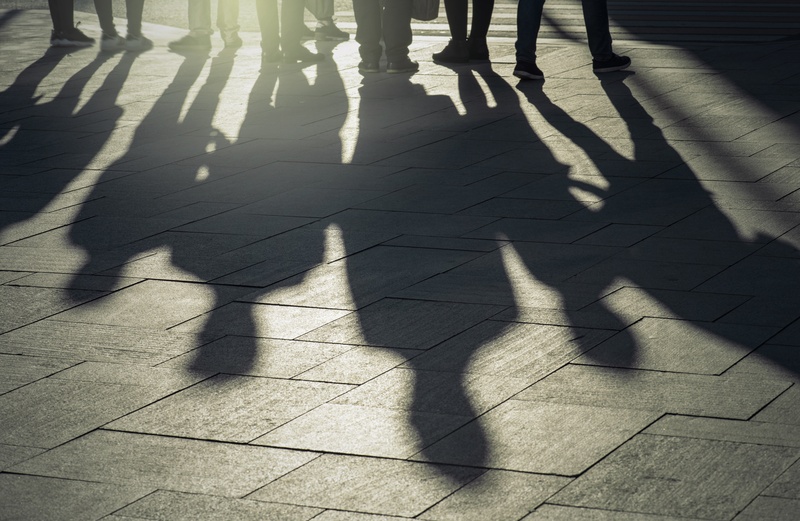 Take steps to make your business more customer-centric through innovative methods, such as customer job shadowing, and using technology to personalize and strengthen your communications. Chris Paradiso reinforces the idea about the importance of getting up close and personal with your customers. The Agency Job Shadow Program is currently being “beta tested” in a limited capacity. 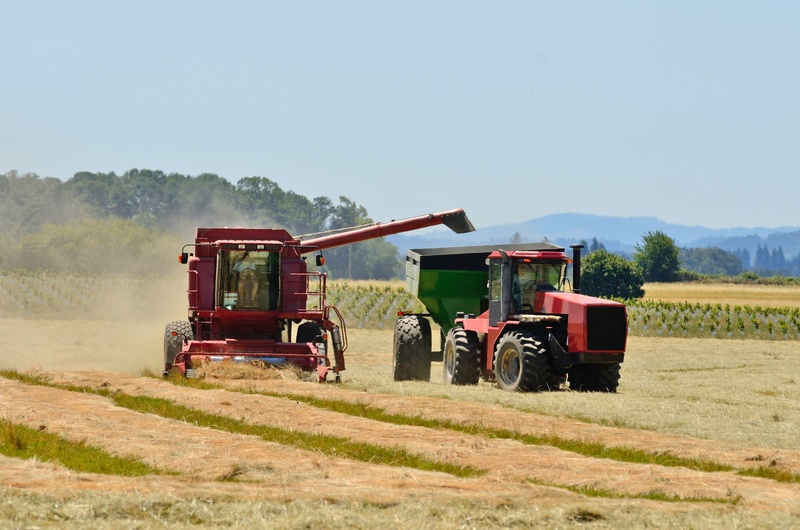 Only agencies located in Oregon’s Willamette Valley are being considered (for their close proximity to HawkSoft HQ). HawkSoft’s Professional Services Department offers the following consulting opportunities to help agencies leverage HawkSoft to meet their unique needs. Off-site, virtual consulting using phone and web-conferencing technology. Many agencies opt for this over on-site as it is a higher value (lower cost for the same benefit). To learn more about these services and the fee schedule for each, please email implementation@hawksoft.com. 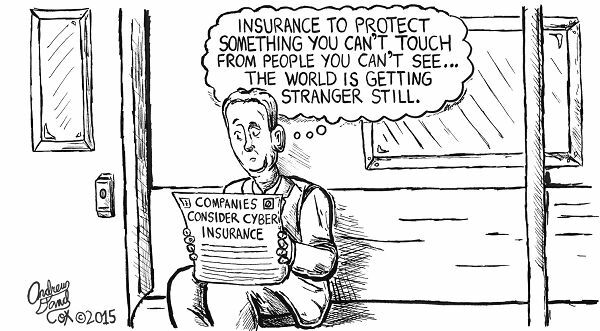 Next post: 3 things agents should learn about cyber insurance and 4 steps to selling it.